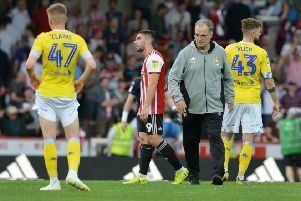 Leeds United were left still looking for a first home win over Sunderland since 2002 after being held at home by the Championship’s bottom team in an incident-packed game at Elland Road. The Whites came from behind with a Pablo Hernandez goal in the second half, but ended with 10 men after full-back Gaetano Berardi was sent-off for a dangerous tackle near the end. How the game ended 1-1 was hard to believe as Leeds hit the woodwork three times and Sunderland twice and countless chances went down at both ends in one of the most entertaining matches at Elland Road this season. Sunderland’s precarious position meant they had to go all out for a win and it meant there was plenty of space for the Whites to play in. Both sides had periods on top when they could not believe they could not take control and it maybe summed up why they have the worst two records in the division since the start of 2018. United made the better start with Hernandez sending a cross-shot wide and young debutant defender Paudie O’Connor getting forward to head over from a corner. Ronaldo Vieira came within a whisker of opening the scoring on 16 minutes when he took Stuart Dallas’s pass in his stride in the box and fired a shot that beat keeper Lee Camp only to bounce back off the post. At the other end Paddy McNair’s shot was deflected and saved by home custodian Bailey Peacock-Farrell. Samuel Saiz saw a shot from the edge of the box beaten away by Camp and a minute later Hernandez got on the end of a superb one,two with Ezgjan Alioski only to see his volley unfortunately hit the keeper on the knee. Sunderland came more into the contest towards the end of the half as Aiden McGeady’s header was comfortably saved by Peacock-Farrell and Ashley Fletcher’s header from a corner crashed against the crossbar. The visitors continued their improvement into the second half and went ahead as McNair lashed a near post shot into the roof of the net after collecting the ball in the area. Leeds looked to hit back, but Pierre-Michel Lasogga could only send a weak header straight to Camp after meeting Hernandez’s cross. McGeady sent a shot wide from range for Sunderland and McNair’s 20-yard shot was well held by Peacock-Farrell. The game really opened up with Leeds switching to a back three and Lasogga sent another weak header wide before Alioski blasted well over after meeting a pull back by substitute Kemar Roofe. George Honeyman’s near post shot hit the post for the visitors and when the rebound fell to McGeady his shot was well blocked by Alioski. It seemed a goal had to come and it was United who got it as Dallas and Saiz combined on a strong break to set up Hernandez, who came up with a measured finish into the bottom corner of the net. Soon after Hernandez fired a 25-yard shot over while at the other end Fletcher’s header from a corner was brilliantly turned over by Peacock-Farrell. McNair then had a great chance to win it for Sunderland when the ball fell to him in the box, but his shot was directed straight at Peacock-Farrell. Leeds produced a big finish, however, and could not believe their luck as Alioski’s diving header hit the crossbar and within a minute Saiz went through only to see his shot well saved. Hernandez’s surging run then set up substitute Caleb Ekuban, but his shot was well blocked. Leeds fans were left shaking their heads again when Saiz’s brilliant free-kick from the edge of the box came back off the post with Camp well beaten. This hugely entertaining game had another twist with the Whites down to 10 men for what turned out to be seven minutes injury-time. Not for the first time Berardi was guilty of a dangerous lunging tackle and did not get the ball. With Sunderland’s Callum McManaman apparently in agony - before making a quick recovery - the red card came out and the full-back now stands to miss most of the rest of the season. Leeds saw out the remainder to keep their point, although they were indebted to Peacock-Farrell again as he turned McManaman’s shot over. United head coach Paul Heckingbottom felt it was an entertaining, wide open game. He said: “There was lots to write and talk about. I can’t remember half of the chances, there were that many. “The highlights reel will show up well for both goalkeepers. Bailey’s made three real good saves for us so I can’t say if only we had taken this chance or that. “With the players out we knew we were going to be weak defensively and we needed to be good offensively. When we made the change in the second half we knew it would open the game up. “We had to take the risk that we could expose ourselves a little bit. Heckingbottom admitted to being frustrated by Berardi’s third sending off this season. He added: “He’s accepted it was a bad tackle. It was not through frustration, he was genuinely going for the ball. Leeds: Peacock-Farrell, Dallas, Jansson, O’Connor, Berardi (sent-off 89), Vieira, Phillips (Roofe 65), Alioski, Saiz (Anita 90), Hernandez, Lasogga (Ekuban 79). Sunderland: Camp, Love, Kone, O’Shea, Wilson, Cattermole (Lua Lua 90+5), McNair, Honeyman (Ejoria 84), Gooch, McGeady (McManaman 89), Fletcher.